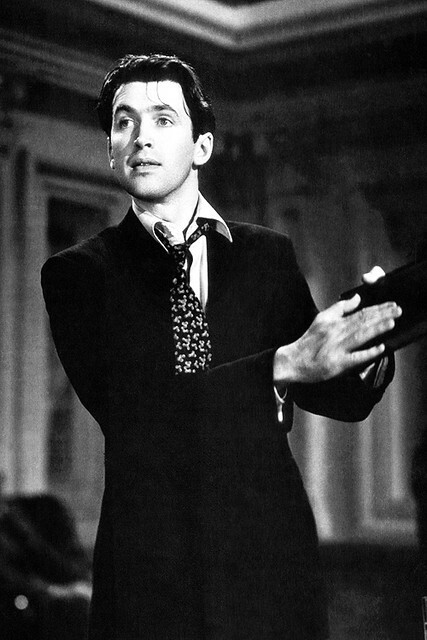 Today, I'm looking at the filibuster scene from Mr. Smith Goes to Washington (1939), starring James Stewart (above) as a newly appointed US Senator who makes his last stand on the floor of the Capitol. This article is part of The " . . . And Scene!" Blogathon hosted by Sister Celluloid. Go here for more pivotal scenes in classic movies. Anyone who believes movies don't matter, should look more closely at Mr. Smith Goes to Washington (1939). Today, the famous filibuster scene in director Frank Capra's political drama is part of the fabric of American life -- it seems that every senator with dreams of the White House tries out a filibuster or two -- but Mr. Smith Goes to Washington was highly controversial during its initial release mostly because of the filibuster scene. Jefferson Smith's valiant stand against corruption also galvanized the European nations that were already embroiled in World War II (the U.S. didn't enter the war until 1941), becoming a rallying point for those who were fighting Nazi oppression. I'll delve into the reasons the filibuster scene is a landmark in American cinema, but, first, here's a little background. Mr. Smith Goes to Washington is based on an unpublished short story by Lewis R. Foster that had been kicking around Hollywood for a few years. Columbia Pictures acquired the rights as a vehicle for Ralph Bellamy, but when that project fizzled out, the script landed in the hands of Capra, then Columbia's premier director. Originally, Capra wanted to make the film as a sequel to his highly popular comedy Mr. 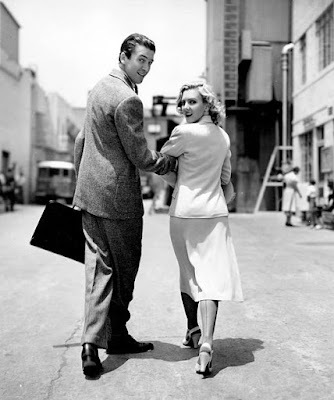 Deeds Goes to Town (1936), but, when star Gary Cooper wasn't available, he signed up James Stewart and Jean Arthur, who worked so well together in You Can't Take It With You (1938). 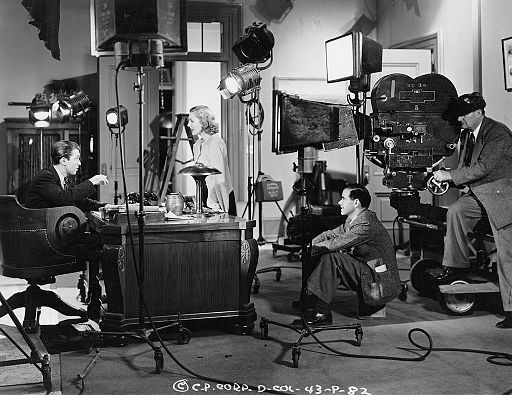 James Stewart and Jean Arthur play a scene in Mr. Smith Goes to Washington (1939) while director Frank Capra (seated) looks on. The filibuster scene (clip below) is the dramatic high point of Mr. Smith Goes to Washington, with the preceding hour and 45 minutes building up to this riveting climax. Mr. Smith Goes to Washington tells the story of Jefferson Smith (Stewart), a naive Boy Rangers guide who is appointed to the US Senate by the corrupt governor (Guy Kibbee) of a Western state. Smith accidentally uncovers widespread graft by the governor and his cronies. He is blackballed by a scheming senior senator, Joseph Paine (Claude Rains), but he makes a last-ditch effort to clear his name with the help of a street-smart political aide (Arthur) and a seasoned reporter (Thomas Mitchell). The filibuster scene is brilliantly directed by Capra, but it's the performances that make the film so riveting. The scene basically plays out like a stage play with the actors, except for Arthur and Mitchell in the gallery, required to rise and say their lines on cue. They respond brilliantly, especially veteran character actor Rains and the great Western star Harry Carey, who plays the president of the senate. 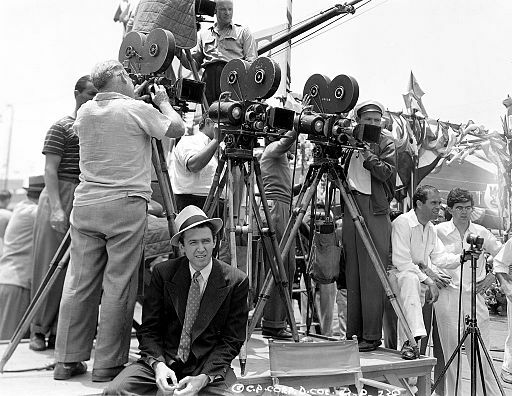 James Stewart relaxes on the set of Mr. Smith Goes to Washington (1939). Obviously, the success or failure of the entire scene hinged on Stewart. He gives an electrifying performance in a role that earned him an Oscar nomination for Best Actor and made him a huge star. The filibuster scene is effective mostly because Stewart is so low-key for most of the movie. Stewart plays the country bumpkin persona to the hilt while giving awkward press conferences and practically sinking through the floor at the sight of any pretty girl. The filibuster is the first time that Smith has any forcefulness at all in his personality. Smith usually turns into a puddle of quivering jelly around Paine, making the moment he shouts back at the senior Senator, "No, I will not yield," so galvanizing for the audience. The shy, self-effacing Smith stands up and raises his voice for probably the first time in his life, and it's as unexpected and electrifying as a lightning strike. James Stewart and Jean Arthur on the set of Mr. Smith Goes to Washington (1939). The filibuster scene also works so well because of the superb set designed by Walter Holscher. He and Capra traveled to Washington to study the Senate chamber, and they meticulously recreated it on two adjoining sets on the Columbia back lot. The huge set did create some problems for Capra and his crew. It was difficult for the camera operators and the sound technicians to properly light the scenes and record the audio in the cavernous set, but none of those difficulties show up onscreen. Capra also faced the huge logistics challenge of having to shoot the action on three different levels: the Senate floor, the viewing gallery, and the dais where Harry Carey sat. 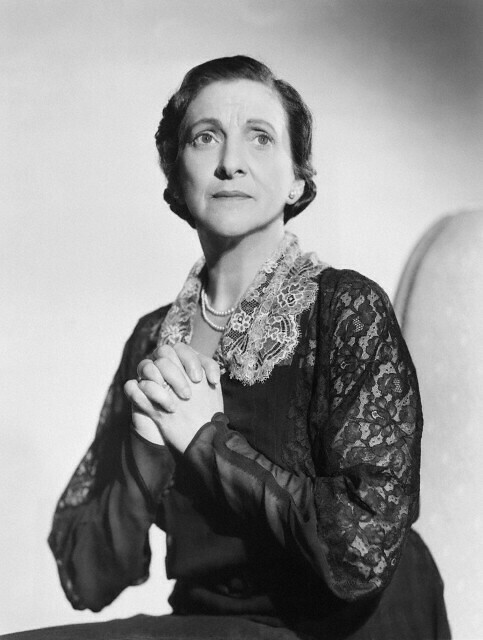 Beulah Bondi as Mrs. Smith in Mr. Smith Goes to Washington (1939). Today, Mr. Smith Goes to Washington is as American as apple pie, but it stirred up a lot of controversy in 1939. The film had a star-spangled premiere at Constitution Hall in Washington D.C. with a National Guard band playing patriotic tunes and immense press coverage. 4,000 people, including 45 senators, packed into the theater, but about halfway through the film, people began to walk out and even shout at the screen because they didn't like the way Washington politics were portrayed in the movie. Kentucky Sen. Alben Barkley was outraged by Harry Carey's portrayal of the senate president, telling the press, that Mr. Smith Goes to Washington showed the Senate as "the biggest nincompoops on record." South Carolina's James Byrnes even wanted to ban the film because he feared it would make America look bad to other countries. 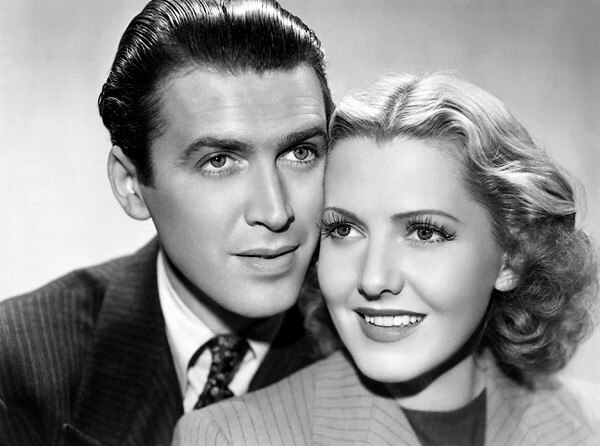 James Stewart and Jean Arthur in a publicity still for Mr. Smith Goes to Washington (1939). Senator Byrnes didn't need to worry about the Fascist reaction to Mr. Smith Goes to Washington: They hated the film even more than the senators did. Mr. Smith Goes to Washington was banned by Adolf Hitler, Benito Mussolini, General Francisco Franco, and Joseph Stalin (there's a line-up for you). In fact, the film was banned in Nazi-occupied France, but one Paris theater owner defied the Germans by playing the movie non-stop for 30 days. Mr. Smith Goes to Washington will air at 3 p.m. July 4 and 4 p.m. Aug. 28 on TCM. It is also available on DVD and video on demand. Yes, indeed! If you want to watch an actor "knock it out of the park", the filibuster scene is just the thing. The reaction in Washington to Capra's film was incredible. The defensiveness of the politicians speaks volumes. Yea, I think there were a lot of "Lewis Paine's" in the 1939 Senate. So glad you covered this scene! I love it so much. I always thank God that Bellamy and Cooper weren't available. :-) Neither of them could have played it anywhere near as brilliantly as Stewart. Oh gosh, the Roberts are SO hard to keep track of. There are millions of them!! I think the politicians were probably expecting a screwball comedy and when they got a drama that showed some senators were corrupt, it shocked them.